We deliver this as an in-house qualification. If you would like to offer your staff a practical and collaborative opportunity to work together in development of their skills in leadership and management, we can help you. A comprehensive, nationally recognised qualification – with a difference, as it incorporates our unique collaborative management principles and practices. 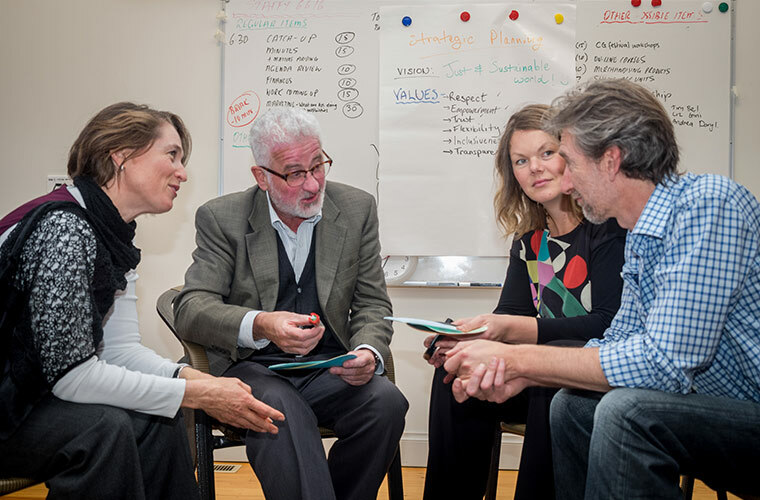 This highly supportive course will expand your understanding of whole-of-person management. It will give you the confidence to manage anywhere – and land on your feet no matter what happens! Our discretionary component means you will specifically strengthen your capacity to work well in areas and issues that are particular to your working needs. Meet our friendly team of professional facilitators, skilled in both facilitation and education. Read more here. A great deal of the learning from this course comes from the process of working together as a group. Learning through participating in a group, enables you to feel how skills are actually applied. Contact days are ‘supportively challenging’. You will learn great things about yourself which will provide a much stronger and more practical foundation for your management and leadership roles. As you will be working together as a group it is important that you attend all sessions To complete the requirements of this course, you must attend at least 90% of the teaching blocks. There are 12 units offered over the duration of the course (see Course Structure below). We craft a comprehensive learning culture by using every unit as a building block for the next. Knowledge and skills introduced are then used extensively throughout the rest of the course. You will be given our comprehensive Diploma of Leadership and Management Manual on Day 1. At the start, we ask participants to talk about their workplace challenges and learning edges. This provides an accurate basis for prioritising the focus for the discretionary component of the training around your particular needs. As required, there can be further Groupwork Institute input around these issues, including useful techniques, processes and some exercises. Content is always related to people’s experience. There is a range of learning tools used – discussion, reflective activities and smaller group work. There will be ample time to address your challenges. Substantial time is devoted to practice for you to embed the learnings, and to apply the techniques to address your challenges. This includes coaching, exercises to explore particular areas, personal and group reflection time, small group practice and socio-drama. There is no teacher like practice! This time enables you to absorb your own learnings acquired through the training, and look at how they can be best applied to the work you do. The Diploma of Leadership and Management BSB51915 course year consists of 19 contact days, structured to cover 12 national competencies. Over 10 blocks of teaching we deliver twelve teaching units (for details see Training Content below). The first block is a four day residential held at our own delightful Commonground Conference and Retreat Venue – nestled in the bush near Seymour, 95 km north of Melbourne. It is essential that you attend the residential – it is an important part of the process of forming the group and starting to develop your learning journey together with other participants. We also cover key foundation units that underpin the rest of the course. Being away together also enables participants to drop into a deeper learning space which significantly helps with embedding your learning. The remaining 15 days are primarily 2 day blocks (and two one-day blocks), delivered on a Tuesday and Wednesday once a month at the Groupwork Institute Training Rooms. There will be work in pairs, small groups as well as the whole group. You will form into small affinity groups at the start of the course according to work interests and/or learning needs. These groups will give you opportunities to practice together, offer each other support, reflect on teachings and to work together on possible projects. You will be expected to meet (outside of structured course contact days) for a minimum of two hours per month. You’re required to complete all assessment tasks, demonstrating competency, to receive your Diploma of Leadership and Management. Evidence-based training is important to ensure that you can apply the learning of this course to your everyday management practice. An average of 14 hours per month is required for assessment work. We’ll support you along the way with your assessment requirements. Getting to know and working on the fears and other self limiting messages that hold us back as managers. Why is collaborative decision-making so powerful in its ability to bring about lasting change, and yet is so challenging to implement? Implementation – who’s doing what?